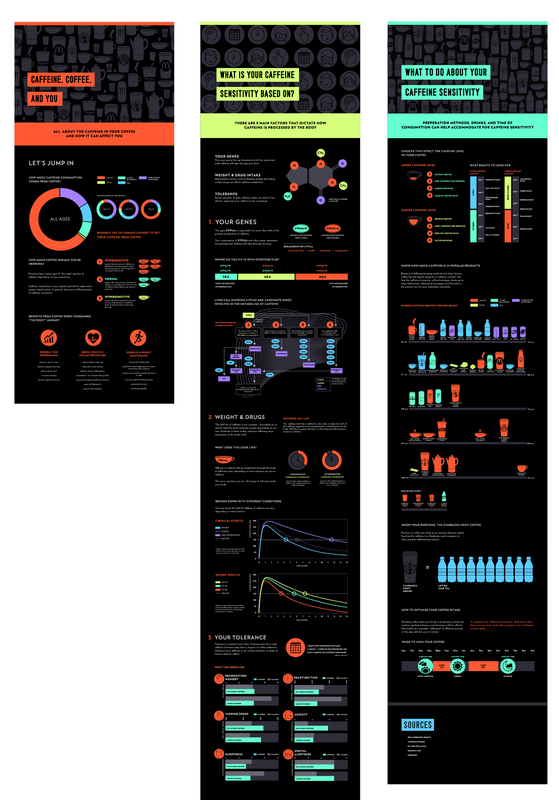 Caffeine, Coffee, and You is a one page scrolling infographic that explores the affects of caffeine in coffee on different individuals, how caffeine in coffee compares to caffeine in other products, and much more. My intention behind the look and feel of this project was to create something bright and vibrate, that symbolizes a “caffeinated” effect, but is also fun and engaging for a viewer to retain information from. I used bold, saturated colors and contrasted them with black/grey tones in order to create an "popping" and vibrant feel. Gif animations that are included in the section headers and dispersed throughout the rest of the site are also intended to add to the energy of the page as a whole.